The new report published by Transparency Market Research, titled “Packer Market - Global Industry Analysis, Size, Share, Growth, Trends, and Forecast 2014 - 2020”, analyzes the global packer market and presents a forecast about the future state of this market over the 2014-2020 period. The report states that the market, which was valued at US$2.7 bn in 2013, will expand at a healthy 9.0% CAGR over the report’s forecast period and rise to a value of US$4.9 bn by 2020. The report states that factors such as an overall rise in the global demand for fossil fuels, spurred by the ever-increasing population and economic development, are crucial in driving the overall demand for packers across the globe. While the demand for energy is continuously rising owing to rapid industrialization, an increase in drilling activities across major oil and gas producing areas is also a key factor driving an increase in demand for packers. The report segments the global packer market based on two criteria: product type and key regional market. Based on type of products, the market is further segmented into permanent packers and retrievable packers. Geography-wise, the market is segmented into North America, Asia Pacific, North America, and the Rest of the World.Of the two product types discussed in the report, the market segment of permanent packers is expected to dominate the global market over the report’s forecast period. Permanent packers are available in a variety of pound-per-square-inch (PSI) ratings in the market. As a result, permanent packers can be employed in a number of high-pressure and high-temperature drilling setups. The low cost and superior functional capacity of permanent packers also make them most suitable for vigorous drilling conditions. Retrievable packers, unlike permanent packers, can be removed from a drilling site after the drilling is completed, during the removal of tubing from the wellbore. Retrievable packers are especially suited for applications that need consecutive recompletion. 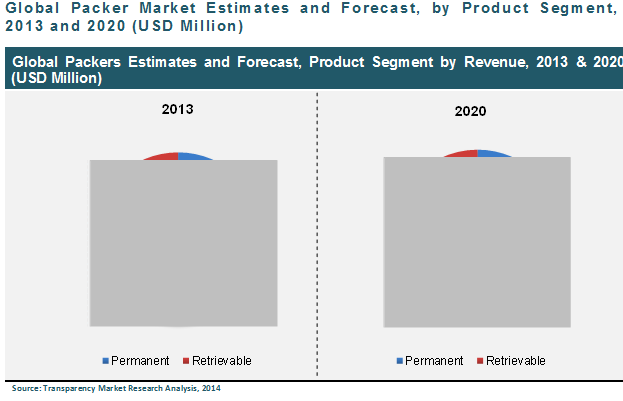 The suitability of retrievable packers for recompletion activities is expected to drive their demand in the coming years.Of the key regional markets studied in the report, the global market for packers is expected to gain its maximum demand from the North America market over the report’s forecast period. Rise in drilling activities in the U.S. and Canada will lead to most of the demand presented for packers from the North America regional market. Declining oil reserves in major European oil and gas repositories will lead to sluggish demand for packers in Europe. A major portion of demand over the report’s forecast period is also expected to arise from countries such as Kazakhstan, Azerbaijan, and Russia. The Rest of the World section of the global market – including the Middle East, Africa, and South America – contains countries with some of the largest oil and gas reserves in the world and is also expected to observe good growth owing to sustained drilling activities.The key businesses operating in the global packer market include Tryton Tool services, Schlumberger Limited, Weatherford International Ltd., Halliburton Company, TIW Corporation, Map Oil Tools, Inc., and Baker Hughes Incorporated.